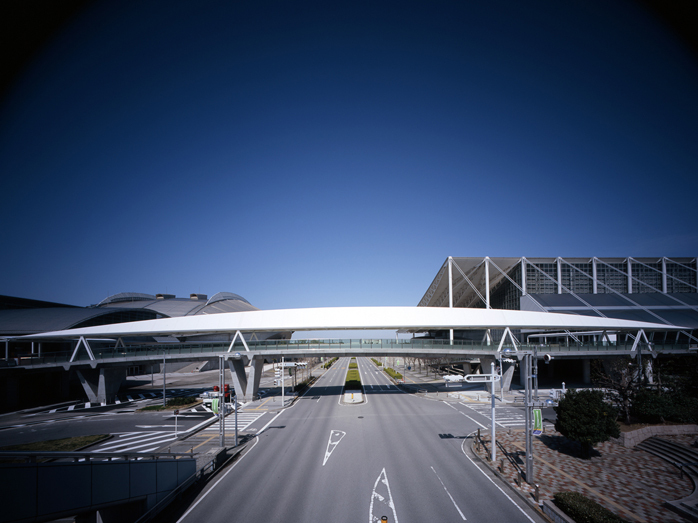 After completion of Makuhari Messe Phase II, a pedestrian bridge with a covered roof connecting Phase I and Phase II was requested given that the two phases were separated by a public road. On the 20th Anniversary, this new pedestrian bridge was completed, providing a fluid connection between the two phases, and increasing the flexibility and potential of the entire complex, totaling 72,000㎡ of exhibition floor area. Given that the arched roofline of Phase I resembles the mountain range and the catenary structure of Phase II evokes billowing waves, the new bridge was designed to create a third identity to create a clear contrast to the color, materiality, and forms of its surroundings. The bridge has a sharp image like an inverted 98m long boat, with a pure white Teflon-coated membrane tent lightly floating above. The structure largely consists of two parts, the bridge girder and the membrane tent framing above. The girder is shaped like an arch, with a gentle curve to provide the required height clearance below. It is constructed of precast concrete, supported by four v-shaped reinforced concrete columns, spanning a maximum of 39m. In order to maximize the spatial experience from below the membrane tent, the slim, steel rods are set three-dimensionally within the vierendeel truss framing instead of coplanar. This three-dimensionally also braces and resists twisting forces due to wind loads. Embraced in gentle light, crossing the pedestrian bridge builds anticipation and excitement. From the road below, the passing driver is welcomed by this urban gateway into the new city.